A New Light is episode 4 from the six-part God In America series which originally aired on PBS in October 2010. These are notes I made while watching this episode. With the nation so focused on the war over slavery, many didn’t realize the waves of Jewish and Catholic immigrants that were starting to change the American religious landscape. Between 1820-1860, more than 5 million immigrants arrived on the eastern shores of the USA. The big fear among the Jewish community is that the religious freedom in the US would cause Jews to “go soft”; forgetting their God and their faith. Wise formed a coed choir, taught in English and German, and modified ancient rituals to make them more accessible for Americans. Some felt that he had watered-down Judaism. He was fired the day before Rosh Hashanah – but he showed up to preach/teach anyway. The president of the congregation punched him and a fight broke out. He left the congregation and started his own “house church”. Wise traveled the East Coast, preaching, teaching, and raising money. He took his message of radical reform with him. Wise felt that the only way for Judaism to survive was to unite under reformed practices. He formed new congregations and a Hebrew school. Jewish immigrants kept arriving, most of them more conservative / traditional in their doctrine and practices. These groups grew stronger and tried to “take back” European Judaism. They believed the laws in the Torah were absolute and unchanging – with no room for interpretation or negotiation. Despite their protestations, by 1880, 90% of America’s synagogues had adopted “Reform Judaism”. 1883 – Wise presided over the first graduating class of his rabbinic school, his proudest accomplishment. Afterwards, he hosted a dinner with 200 of the most distinguished Jewish leaders from across the country. The menu violated several Biblical laws, including clams (shellfish), shrimp salad (shellfish), beef in a cream sauce (milk & meat products together), lobster bisque, etc. Many of those in attendance saw this as a slap in the face of traditional Jewish beliefs. Wise refused to apologize. His attempt at unifying American Judaism had failed. Every religious group had to struggle with similar issues – do we accept/embrace modernity or cling to the old expressions and traditions. Charles Augustus Briggs (American Presbyterian minister) traveled to Berlin to engage the scientific debate, most specifically, Charles Darwin’s recent publication Theory of Evolution. The emergence of rational thought challenged the church’s literalist perspectives. · How could Moses have written the first five books of the Bible if it describes things that took place after his death? · Why are there two creation stories in Genesis? · If David wrote the Psalms, how could he have used words that didn’t exist while he was alive? Briggs tried to look beyond literal inconsistencies and find larger themes in Scripture. · If Jonah wasn’t swallowed by a whale, what did God mean to teach through this story? January 1891 – Briggs decided to share his “new ideas” with people at Union Theological Seminary. Among these ideas was that the Bible, like all things, had evolved and changed over time, and that the Bible had to be scrutinized and analyzed. Only his students liked it – everyone else sat in silence. The Presbyterian Church charged him with heresy. They held many public trials spanning two years. Briggs was suspended indefinitely. This started a national debate among American Protestants: Is the Bible “divinely inspired yet imperfect” or “God’s literal, perfect Word”? In other words, can “reason” be applied to a view of Scripture? William Jennings Bryan (congressman from Nebraska) led the charge to preserve the traditional view of Scripture, and wanted to see the Bible return to the center of American society. 1896 – Bryan became the Democratic Party’s candidate for President. He was the champion of the poor, oppressed, small-town, farmer, etc. He lost the election, but continued to travel the country speaking (preaching?) to massive crowds. Bryan was a throwback Evangelical Protestant, beloved by people who lamented the sad state of American life. 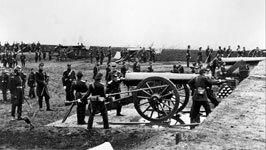 1914 – World War I. Many believed the forces of Modernity were to blame for the catastrophic loss of life brought on by human ingenuity. Traditional Protestants saw WWI as a warning from God that Christians had strayed from God’s perfect plan (a literal reading of the Bible). A new group was formed – Fundamentalists. William Jennings Bryan became the spokesperson for the Fundamentalists. The greatest challenge to the cause of Fundamentalists was Darwin’s Theory of Evolution. They launched a national campaign to remove the teaching of Evolution in all American schools. July 1925 – "The Trial of the Century” came to the small town of Dayton, TN. Local biology teacher, John Scopes, defied the state law banning Evolution teaching in his classroom. Chicago lawyer, Clarence Darrow, defended Scopes; Bryan was the lead attorney for the prosecution. The trial became known as “The Monkey Trial”. It was broadcast nationally on WGN radio. Darrow wanted to put many liberal Christians on the stand to articulate that the application of reason / science was compatible with a faithful interpretation of Scripture. The judge didn’t allow these experts to take the stand. So he puts Bryan on the stand as the Biblical expert. Darrow was able to get Bryan to admit that he didn’t think “a day” in Genesis necessarily meant a “24 hour day.” He also indicated that creation “may have been going on for millions of years.” The judge adjourned immediately. The next day, the judge erased Bryan’s testimony from the record. Scopes was found guilty. But in the court of public opinion, Darrow and the age of reason were the winners. The next week, Bryan died in his sleep. The Fundamentalists lost their national spokesman. The divide was no longer between Jews / Catholics / Protestants…but between Fundamentalists (conservatives) and Modernists (liberals). A Nation Reborn is episode 3 from the six-part God In America series which originally aired on PBS in October 2010. These are notes I made while watching this episode. In the 19th century, most people believed that God had a special purpose for America; but there was disagreement about what God wanted. This came to a boiling point around the issue of slavery. Ironically, Abraham Lincoln was President during this time. 1844 – Methodists were the largest religious group in the country. Bishop James Osgood Andrew was on his way to New York for their national assembly; worried about infighting among Methodist pastors and congregations about slavery. Abolitionists believed that clergy should speak out against the “sin” of slavery, in the same way they were outspoken about other sins. One of leading Abolitionists was Frederick Douglass, a former slave that had fled to the North. He saw Christianity as liberating – both spiritually and physically. He believed that the Christian church was “in bed” with slave owners. Bishop Andrew was a slave owner and was brought into question at the assembly in New York. There was much proof-texting regarding the subject of slavery. People “for” slavery cited examples in scripture where slave owners were among God’s chosen people (and, therefore, were bound for heaven). People “against” slavery could not point to any text which indicated slave ownership as incompatible with a Christian lifestyle. The northern clergy voted to remove Andrew; the southern clergy wanted him to remain. The North prevailed, and the South broke away and formed the Methodist Episcipal Church South. Other Protestant denominations splintered as well. Enter religious skeptic, President Abraham Lincoln. Spring 1861 – seven southern states seceded from the Union. “Lincoln believed that Democracy should trump self-righteous religious conviction.” Southern leaders drafted a Constitution that, unlike the United States Constitution, “invoked the favor and guidance of Almighty God.” It wasn’t just a war about slavery; it was a religious war. Southerners felt that God was on their side…and that their cause was God’s cause. Nothing less than eternal salvation was at stake. As the war played out, and casualties mounted, both sides had to wrestle with the idea that God wasn’t choosing sides. “Good and bad” people were dying. September 1862 – after the Union victory at the Battle of Antietam, Lincoln felt this was a “sign” that he make a declarative statement abolishing slavery in the Confederate states. On January 1, 1863, Lincoln signed the Emancipation Proclamation into law, freeing slaves in the rebel states. This was, for slaves, the “coming of the Lord.” Southern slave owners ignored this new law. As the war continued, Lincoln asked people who were suffering losses to think of their sacrifices as not unlike Christ’s sacrifice. “This redemptive bloodshed is like Christ’s redemptive bloodshed. It will lead to a new birth of freedom for all people.” The war will redefine human freedom – and the North must win. Lincoln found solace in the Book of Job – a righteous man who endured great suffering. The North won the Civil War in 1865. Many in the North felt that the victory was a vindication and justification that God was on their side. Lincoln, however, did not share their sense of joy. At his 2nd Inaugural, Lincoln asserts that the war was God’s punishment for 250 years of slavery. This was no cause for celebration. About halfway through his speech, African-Americans began to chant “Bless the Lord” after every sentence. Prior to that moment, the crowd was silent. Lincoln was shot on Good Friday, six weeks after his Inaugural Address. Religious leaders saw Lincoln’s death as an “atonement” – an offering to God as the last casualty of the Civil War. He bore the sins of a nation with his death. A New Eden is episode 2 from the six-part God In America series which originally aired on PBS in October 2010. These are notes I made while watching this episode. 1773 – Jeremiah Moore (Baptist from VA) was put in jail for “preaching without a license.” Virginian Baptists were “evangelical Christians” who believed that people must have a personal encounter with God/Jesus in order to be saved. You had to “testify persuasively that you have been converted” and be baptized as an adult. The elite, ruling class in VA were Anglicans. Everyone paid taxes that went to maintaining their local Anglican parish. Baptists were receiving converts from disenfranchised Anglicans that felt under/misrepresented. Therefore, laws were enacted to limit when/where non-Anglicans could preach. The more Baptist ministers were punished, the more popular their cause became. The man who advocated for the Baptists in the court was Thomas Jefferson; just a few weeks on the heels drafting the Declaration of Independence. Jefferson was “spiritual-but-not-religious” – he created his own version of the gospels by literally cutting out the sections he didn’t like (miracles, healings, etc.). Jefferson and the Baptists made strange bedfellows; disagreeing theologically but agreeing philosophically in the freedom of religion. Jefferson wrote a bill, calling for the end of government-supported religious institutions and allowing for the freedom of religion. Many disagreed, including fellow revolutionary, Patrick Henry, who wrote a bill that would use state funds to keep all approved denominations in the black. Jefferson’s bill prevailed. When the Constitution was presented in 1787, however, no mention of religious freedom was mentioned in any of the seven articles. 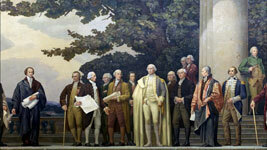 Jefferson wrote a guarantee of individual rights, what we now know as the Bill of Rights. By the turn of the century, 200 wagons each day were setting out for the West. The great religious marketplace would unfold on the American frontier. 1801 - James Finley went to a “revival” in Cain Ridge, KY…skeptical of this kind of religious expression. Ministers feared a spiritual crisis in America – fewer people were going to church than before the Revolutionary War. The religious freedom experiment was failing. When he got to Cain Ridge, Finley saw 20,000+ people gathered in the wilderness; singing, shrieking, laughing, crying, and being slain by the Spirit. Finley has a conversion experience, despite his boasts that there would be no such transformation. For the next 20 years, revivals / camp meetings exploded across the country. By 1811, over 1 million Americans were attending at least one religious revival a year. New denominations (and leaders) sprung up in every community. 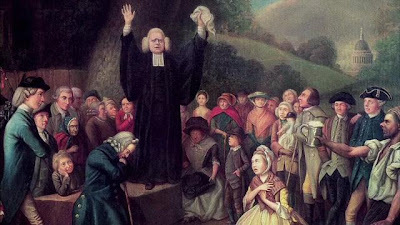 Methodism grew faster and stronger than any other denomination – it’s a “religion of the heart”, which appealed to the sensibilities of early 19th century Americans. James Finley became a Methodist minister and was influential in many socio-religious changes. His popularity rose form his work as a traveling preacher (itinerant) in the frontier. (Known as “Circuit Riders”) People liked these itinerants because they had an everyman quality. The Circuit Riders didn’t just bring religion, they brought educational infrastructure. By 1850, more Americans were going to church than ever before…and 2/3 of churchgoers were evangelical protestants. With this surge in these evangelical expressions of faith came the desire to “Christianize” American society…“make it look more like the kingdom of God”. Evangelical Christianity was no longer about a personal experience, but about a pervasive Christian culture. Schools, hospitals, abolition, women’s rights, prisons, orphanages – all were started by evangelical Christians in the mid-1800s. Evangelical Protestants established the infrastructure that America needed. As America grew, it drew hundreds of thousands of European immigrants to the new world. Most of the immigrants were Irish Catholics – the religion that American Protestants had been resisting for the last 300 years. Irish Catholicism became a threat to Protestant America. By 1840, 25% of New Yorkers were Catholic. Hostility grew. Riots raged in Boston, Philadelphia, and New York. John Hughes (the most outspoken American Catholic Bishop) tried to make Americans “accept that their new Eden had to include Catholics.” He called the country to live up to the religious freedoms promised in the Constitution. Hughes felt that the (NYPSS) New York Public School Society (founded by Quakers) were promoting anti-Catholic rhetoric…that they were, in essence, state-sponsored Protestant schools. (Sang Protestant hymns, most teachers were current or retired ministers, Protestant Bible study etc.) This became the major issue that inspired him. Hughes petitioned the NY City Council, demanding that if public schools were teaching Protestantism, then Catholics should be given money to set up their own schools. He is making an American, religious liberty case for school funding; the same case that evangelical Protestants used to establish their own majority. In the end, John Hughes lost the vote 15-1. The Protestant establishment thought this was the end of the matter.. Hughes responded by raising tons of money to start parochial schools. Additionally, Hughes told Catholics how to vote in upcoming elections so he could, eventually, sway the political process in his favor. The Protestant establishment got angry, but to no avail. All but 3 of Hughes’ candidates won. In April 1842, a bill was passed which ended religious instruction in public schools. Religious liberty prevailed. The State of Iowa High School Wrestling tournament is being held this week in Des Moines. Most of the pre-tournament buzz around town was that two girls had qualified for the 112-pound weight class. It is the first time a female competitor had made the tournament. This quickly became national sports news when one of the girls' first round opponents defaulted from their match today, citing personal and religious convictions. ...in a brief statement issued through his school, (Joel) Northrup said he defaulted on his match with Cassy Herkelman because he doesn't think boys and girls should compete in the sport. "I have a tremendous amount of respect for Cassy and Megan (Black) and their accomplishments. However, wrestling is a combat sport and it can get violent at times," said Northrup. "As a matter of conscience and my faith I do not believe that it is appropriate for a boy to engage a girl in this manner. It is unfortunate that I have been placed in a situation not seen in most other high school sports in Iowa." This is a fascinating story involving the bound conscience of a young man who doesn't think it's "right" for boys and girls to be engaged in such an intimate and violent sport. My inclination is to respect Northrup's decision, if for no other reason than because he defaulted honorably. He didn't whine or complain. He didn't besmirch the two female wrestlers' accomplishments or say anything pejorative about the presence of girls in a boys sport. Furthermore, there seems to be mutual admiration between the Northrup and Herkelman families, even though they both wish it would have played out differently. It is possible that Northrup and Herkelman could face each other in the consolation round. In the meantime, there will be no shortage of commentary on this complex issue. This pushes all of my topical buttons - sports, religion, young people (not to mention that Herkelman is from my hometown of Cedar Falls) - and I, for one, can't wait to see how it all unfolds. A New Adam is episode 1 from the six-part God In America series which originally aired on PBS in October 2010. These are notes I made while watching this episode. Spanish missionaries first encountered the Pueblo Indians in the early 17th century. The Spanish came with absolute-truth claims of salvation…received the generous hospitality of the Pueblos…and built churches. The Pueblo’s came to the churches to see what the Christians had to say, but weren’t going to allow Christianity to replace the native spirituality. 1675 – 47 Pueblo religious leaders were placed in jail; 5 were publicly killed. The Pueblos responded by declaring war on the Franciscan friars. More than ½ the priests were killed. The Spanish left the region in 1680. 1629 -- Puritans came to Mass. to save Christianity from the corruption of the Church of England. The first winter, nearly 50% of the colony froze or starved to death. The people took this as a sign that they weren’t pious / faithful enough and that God had abandoned them. Winthrop responded by enacting strict conformist laws so that God would bless them colony – which contradicted the core conviction of the Puritan ideals of religious freedom. 1634 – Anne Hutchinson (a pastor’s kid) arrives in Boston and becomes a high-profile member of the colony. She believed God had spoken to her directly, guaranteeing her salvation. Puritans believed that salvation was never fully assured; it depended on good works. Hutchinson was arrested for leading a religious gathering as a woman, and for disagreeing with the General Assembly. She goes in front of Winthrop and other judges and crushes them the first day…and the second day she claims to have heard God’s voice saying that the judges will be cursed if they disagree with her. So she is banished for being “unfit” for the colony. In the next 100 years, over 1 million people of varying faiths and nations come to America. Rev. George Whitfield believes that the New Land can find its bearings by having everyone be “born again” (which he understood to be a transformation of the soul by the Holy Spirit). He had been “reborn” as a professor in Oxford. He came to America to travel the country to save people’s souls from their sinfulness. Puritans renamed themselves the Congregational Church and became the official church of NH, MA, CT and didn’t tolerate other denominations. Lutherans, Baptists, Quakers, Presbyterians and others found a home in other states. VA, SC, NC, GA were strongly Anglican, in the same way the Congregationalists reigned in the north. Whitfield came to Charleston, SC and pissed off the Anglican priests because it undermined their conformist / moral society. The Baptists embraced him. Denominations didn’t matter to Whitfield – all that mattered is that you had this one re-birth experience. In 1740 Whitfield traveled 5,000 miles, preached 350 times in 75 towns/cities. 20,000 people came to hear him in Boston, 12,000 in Philadelphia, 8,000 in New York City. 25% of the country had heard Whitfield preach. Charles Chauncy (Mass.) challenged Whitfield’s populist appeal. It set up a tension between the highly-emotional, less educated crowd and the intellectual, conventional establishment. People began leaving the established church – for the first time people felt they had an individual choice of how/where they would worship. This added fuel to the revolutionary fire that was stirring in the colonies…freedom of/from religion isn’t just the will of the people, it’s the will of God. They reference the Exodus story --> slavery-freedom, old world-new world, Pharaoh (King George)-democracy. A few months ago, PBS aired God In America; a six-part series examining "the tumultuous 400-year history of the intersection of religion and public life in America." In short, I love this series. As I scour the episodes for clips to use in various ministry contexts, I've been taking copious notes...which I will be sharing in this space in the days ahead.